UPDATE: At the Field of Dreams screening I ran into Eric Pearson, CEO/President of the El Paso Community Foundation. To my surprise, he recognized me and then told me, "Well, you know the drill". I had to explain that I DIDN'T know the drill, and he gave me an e-mail address with the instruction to send a list of films I would see to have a ticket reserved. They're so nice at the EPCF and PCFF. I keep forgetting. All appears to be taken care of, a case of missed communications run amok. Well, it's another round at the Plaza Classic Film Festival. I have been a firm supporter of the PCFF since its inception, what, seven years ago. Again I have to make difficult choices about what I will see, but now those decisions are compounded by the fact that the EP Baseball team has games at the exact same time. It's really no contest: the PCFF comes first, but I have a feeling I might squeeze in a game or two during these hectic weeks. In fact, Baseball and Classic Films combine in a 'if you can't beat'em' mindset. 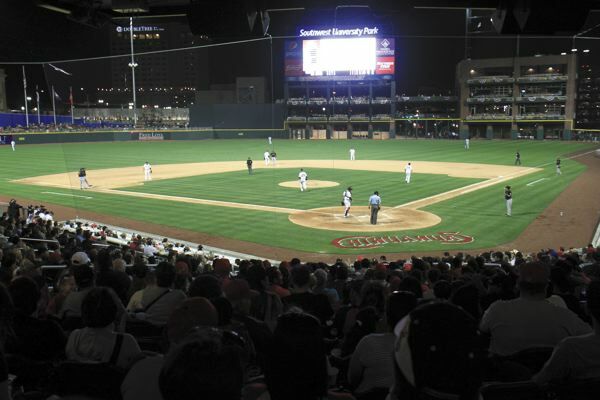 The Festival opens with Field of Dreams at Southwest University Park (the new baseball park). Other baseball-related films from Pride of the Yankees to A League of Their Own and The Bad News Bears will be featured at the Festival. The PCFF will also feature their first Charlie Chaplin film, The Kid, along with his Honorary Oscar acceptance speech (which to me is the greatest Oscar moment in history...unless EP Baseball First Baseman Cody Decker wants to contradict me on THAT too). Chaplin, who had been all but driven out by Hollywood thanks to a mix of his political and private lives, returned one last time to the Academy Awards' longest ovation. A documentary about Chaplin, Charlie: The Life and Art of Charles Chaplin, will also be featured at the festival. This year will also have an expansion of 'classic'. Along with films enshrined in the Hall of Masterpieces (Rear Window, Spartacus, A Night at the Opera), there will be both 'newer' films (Indiana Jones & The Temple of Doom, which I won't go to because frankly it traumatized me as a child) and films that perhaps will be held in higher regard (Harry Potter & The Sorcerer's Stone, Matilda, the animated Anastasia). There will also be special screenings of new films with local connections, like director and El Pasoan Ryan Piers Williams' films X/Y and Kilimanjaro. Finally, there will be the usual concerts and free screenings, like The Rocky Horror Picture Show and The Who: The Kids are Alright. Among the special guests will be Academy Award-winner Shirley Jones (introducing both Oklahoma! and Elmer Gantry) and Robert Wagner (introducing The Towering Inferno and A Kiss Before Dying). A big change is the introduction of Spanish-language films. We've had foreign-language films before, but this is the first time that to my knowledge the predominantly Hispanic population is being recognized with a Cantiflas film (El Bolero de Raquel) along with another classic from Mexican cinema (Salon Mexico). This is especially pleasing to me because there has never been any real acknowledgment that the Plaza, before it closed, did show Mexican films. I have vague memories of my mother taking my grandmother and myself to the Plaza to see films by Mario Almada, "La India Maria", Cantinflas, and Vicente Fernandez. Granted, I was more interested in playing in the theater than in some of the movies, but why the idea that the Plaza basically stopped showing all films in the 1970s still holds I don't know. For this year, there might be a dramatic change. Normally, my selections tend to be a mix of films that I have seen and not seen, but this year with perhaps one exception, every film I plan to see is one I have never seen. In case you couldn't tell, Safety Last! is the only film on my tentative list that I HAVE seen. This is an ambitious schedule by any stretch in my opinion. As usual, there are films that I simply cannot go to despite wanting to. Work prevents me from seeing among others as The Kid, Crimes of the Heart, Salon Mexico, Chasing Ice, and Wuthering Heights. Work may also prevent me from seeing the only film I really want to see: A Hard Day's Night. It's scheduled for a Wednesday, and usually I leave work at 6 on Wednesdays, so I took it for granted I would be able to go. In a bizarre turn of events, I leave every Wednesday at 6 this month...except THAT particular Wednesday, when I'm scheduled to leave at 7! IF that schedule holds, then I will have to miss it. I don't know why THAT particular Wednesday my schedule was altered, and for right now it's iffy if I go or not. Of course, this schedule is not set in stone. Perhaps some will sell out before I get tickets, perhaps I may opt to go to others, like the Closing Film, All the President's Men. In all the years of the PCFF, I have never been to the Closing Film. Then there is the problem of cost. The Plaza Classic Film Festival has always been hit-and-miss with regards to my press accreditation. Last year, the PCFF was very accommodating once I informed them that I was an Online Film Critics Society member covering the festival. The year prior, I couldn't get them to arrest me, and it looks like this year I'm stuck in that boat again. As of today I have submitted two requests for Press Accreditation and have not heard anything from them. I went ahead and bought my Field of Dreams ticket, but this might be the one film I see for my own pleasure apart from formal coverage, so I won't press the issue for this one. Even with tickets ranging from $4 to $8 per film however, that's still a pretty penny. This if anything is my great difficulty with the PCFF. I love going, I support it, but there rarely seems to be anyone I as a member of the press can contact to set things up. Last year the website had a Press Contact link, this year none. It leaves me in a most difficult situation: pay for tickets even though I'm there for professional reasons, or not pay and basically ignore a cinema event in my hometown. I could either shirk my responsibility as an OFCS member due to funding, or put up my own money despite being a legitimate member of the press. Again, with Field of Dreams I'm not arguing because that one is more personal than professional (I don't intend to bring my notebook). As for the others, I will be taking notes, and while new releases don't acknowledge my OFCS Pass, I'm sure at the TCM Classic Film Festival or any other festival I wouldn't have such difficulties as I do with the PCFF. I know it sounds like I'm complaining, and it isn't my intent to do so. It's merely frustrating to try to do your job and finding things (to my mind) needlessly complicated. Who knows: things may turn out all right in the end. In any case, the first film, Field of Dreams, is this Wednesday (geez, that's TOMORROW! ), and for the next week and some-odd days I will do my best to cover the Plaza Classic Film Festival to the best of my abilities and to the extent possible in regards to time and money.